For much of the 20th century, angel investment and venture capital (VC) played a minor role in Nova Scotia’s economy. Today, however, Atlantic Canada’s start-up and VC community is booming, particularly in Halifax. To understand why these investment tools are succeeding in the region, it is instructive to review the history of VC in the province from the perspective of supply factors and demand factors. This lack of demand is the result of many different factors. First and foremost, the Nova Scotia economy traditionally comprised primary sectors such as mining, forestry, fishing, and steel and banks typically dominate early stage financing in these industries (or through the use of convertible bonds). In contrast, VC investment is usually an individual investor or fund manager taking an equity stake with uncertain returns. Demand for robust angel markets, therefore, did not truly arrive until Nova Scotia’s economy began diversifying in the 1990s. The paper may be the first recorded interest of a provincial party leader in developing angel markets, insofar as “patient capital” has long been synonymous with angel investment. However, MacLean’s quotation, and it’s allusion to “free money,” must be read in the context of the province’s development policies: the fiscal constraints of early 1990s featured a growing consensus against expensive industrial policies that experts saw as low-impact and high-cost. Furthermore, the public often displayed skepticism about favouritism, patronage, and corporatism. As detailed in The Savage Years, the reform era of the 1990s included an effort to redesign Nova Scotia’s economic development policy to depoliticize and cost-minimize various programs. Among MacLean’s proposals were the creation of a Nova Scotia investment vehicle eligible for retirement accounts and “a more all-encompassing plan, where all local investment results in tax credits, and where a wider, more diversified range of companies are eligible.” This plan would encourage community investment while controlling costs and decentralizing decision making. 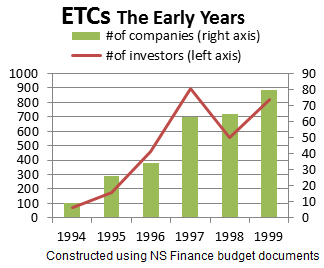 The latter proposal came to fruition shortly thereafter, in 1993, when the Nova Scotia provincial government enacted the Equity Tax Credit Act, the stated intent of which was “creating an important pool of venture capital for the province” by encouraging investment in small- and medium-sized businesses. The Act created a 30 per cent “equity tax credit” (ETC) for investments in businesses with fewer than $25 million in assets and revenues, a head office in the province, and at least 25 per cent of wages paid in-province. Nova Scotia’s government raised this rate to 35 per cent in 2010 and the maximum annual tax credit to $17,500, or 35 per cent of a $50,000 investment, with a five year holding period. ETCs immediately proved popular and uptake accelerated into the late 1990s. Interest in developing Nova Scotia’s venture capital market continued through the mid 1990s and, in 1994, the Atlantic Provinces Economic Council (APEC) submitted a report to the Working Committee on Venture Capital titled Equity Investment in Atlantic Canada: A Key to Entrepreneurial Expansion. Among its recommendations was the creation of a privately-managed $30 million Atlantic Investment Fund (AIF) for the four Atlantic provinces. This proposal would sit relatively idle for nearly two decades until the 2013 announcement of Build Ventures, currently capitalized at $48.5 million. 1994-5 also saw pass the Innovation Corporation Act, establishing Innovacorp as a crown corporation involved in early stage VC (and absorbing the Nova Scotia Research Foundation). The 2001 tax credit review by the provincial Department of Finance echoes the buzz around VC from the time: Nova Scotia is gaining a national profile in the venture capital community. This is largely attributable to the favorable economic performance of the Halifax area in recent years. All this history is just to show that the resurgence of the VC community in the last few years is not without precedent. In a future post, I will turn to the contemporary landscape, and assess the viability of Nova Scotia’s start-up landscape going forward. This entry was posted in Economics and tagged angel, business, capitalism, investment, Nova Scotia, start-up, venture capital. Bookmark the permalink.